Your loved one will love indulging in the magnificent flavor of gourmet confections this holiday season. 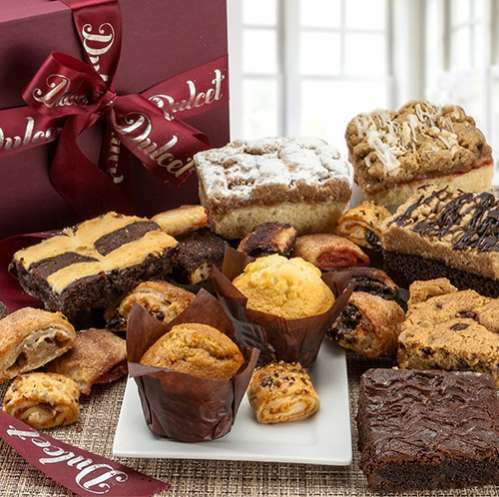 Gourmet gift baskets are not all created equally, and Dulcet’s Assorted Bakery Deluxe Gift Basket is proof. Overflowing with the mouthwatering goodness of heavenly crumb cakes, tantalizing brownies, magnificent muffins, and ½ assorted rugelach, this elegant gift is certain to be a favorite of even the most finicky recipients. Baked with only the finest ingredients, these fine confections are beautifully arranged in an elegant maroon and silver gift box that adds an exquisite touch to your holiday festivities. These divine gourmet gift baskets are an excellent Christmas gift idea for loved ones who live far away, that special couple down the street, and even your own family at home. The perfect accompaniment to fine wine, relaxing tea, or even eggnog, these gourmet goodies are just what your loved ones need to complete their holiday experience. Order your Assorted Bakery Deluxe Gift Basket today, and enjoy fast, FREE ground shipping so your loved one can begin indulging in gourmet perfection in time for those upcoming holiday celebrations. Be sure to include a personal message to your recipient to add that special touch! Add a special touch to your gift when you submit a personalized message to be included with delivery.